We had another family christening on Saturday. These make me feel old, as it feels like yesterday that I was attending the father’s christening. Arriving on time is always stressful, and not especially helped by my watch, which was 10 minutes slow. In panic, while pulling on tights and trying to find heels, I asked Husband if he could write the card. This was not as simple as I had anticipated, and I was asked a range of questions, such as: “Do I address it to the baby or the parents?” and “What the heck am I supposed to write to a baby?” I dictated the card, he stuck it onto the gift, and we were set. Daughter decided to buy her own gift. I’m sure the parents will be delighted when they unwrap the super-sized unicorn in their tiny house (and I’m sure Daughter had only the best motives when she chose one quite so large). Actual event was lovely. Always nice to see extended family (and always slightly odd to see the not-related-but-we met-you-once-at-the-wedding, who are all, of course, as closely related to baby as we are, even if not at all related to us). It was a very windy day, so I was glad it was a christening and not a wedding, and we didn’t all have to pose for photographs. 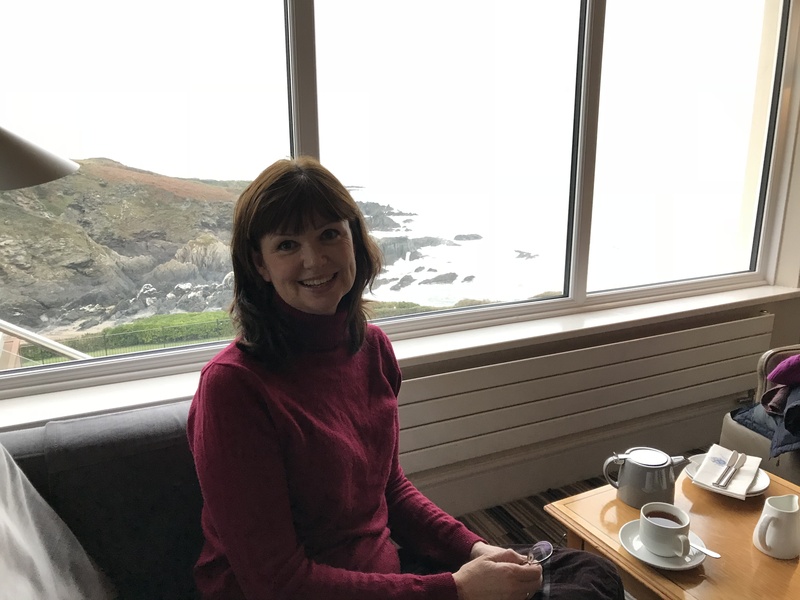 We did though, have to be smartly dressed, and I do find walking in heels bit of a struggle these days – I really ought to practise – living in jeans and wellies means wearing dresses and heels is difficult. The service was in a tiny village called Markbeech. My son finds this very weird, as my latest novels are all set in an imaginary town called Marksbridge (not based, even remotely, on the village which shares a similar name). The church was very interesting, I haven’t visited before, it’s one of those little churches which used to belong to an estate (all very English and historical). As I sat, listening to the service and watching the baby (very well-behaved and asleep for most of the service) and his brother (very cute) I peered around the church. The decorations around the altar were symbolic, relating to the spirituality of women, and looked – to my uneducated eyes – rather masonic in style. Not sure why, perhaps it was the triangles and rainbows. Anyway, after the service, I did a little research, to try and learn more. It was set up in the early 19th century, as part of the “Tractarian” movement – which was inspired by a sermon by John Keble in Oxford (and is also known as ‘the Oxford Movement’). They believed that the Anglican Church was, in effect, still part of the Catholic Church, that clergy were answerable to God, not the state, and the liturgy etc should all be influenced by the church in Rome – not by kings. In effect, they were sort of the opposite of the ‘protestants’ (a term which means they were protesting against the rule of the Roman Catholic Church – mainly so that Henry VIII could get divorced – way back in 1534). Anyway, the Tractarians produced lots of tracts (90, I believe) which is how they gained their name. They had support from some influential people (who even I have heard of, such as Wilberforce) but they didn’t in the end, manage to separate the church from the state, and even today, our monarch is head of the church. 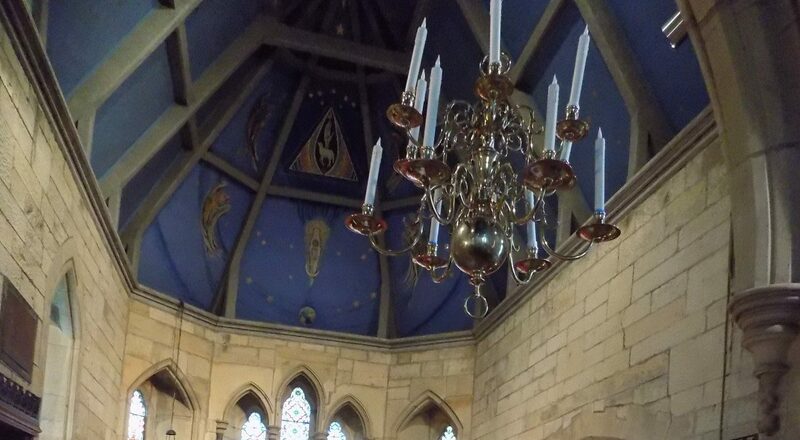 I never managed to find out why Markbeech church has the unusual painting decorating the altar. If ever you’re passing through Kent, it’s worth a visit (if you like old English churches). Hope you have an interesting week.